I corrected some mistakes from the last TAS along with using new discoveries to save 18,371 frames. I was initially hesitant to improve it given the reception for it being dull due to the off-screen glitches. My interest started after the Youtube user ""Luigi the Best" discovered a way tospawn objects out of bounds. Given that you can pretty much go OoB in almost every single floor by simply entering it and fall/drown while holding A+B, I immediately started the TAS. I used the bios because the intro can be skipped with a reset. It is several frames faster to use a hard reset, if the bios was skipped. However, with the bios played, it ends up being slower. I included it since on console it's included, and therefore it would not be fair to "save" time solely because a hard reset on emulator doesn't play the bios. And before anyone asks, a soft-reset it used this time. The lobby section is the same as before. This time, I enter Basement 1 using the carpet boss door so I can pull off an amazing glitch. Pressing the button triggers the carpet cutscene. Normally it starts as soon as you enter the door, but since I skipped triggering the boss from the first floor, that does not happen. I get clipped into the garbage pile, and zip out of bounds. From here, I move to coords ~10, ~10 (in Fixed Point 16.16) and pause the game to spawn a set of stairs to go back to the first floor. I pause the game once to spawn a set of stairs back to Basement 1, but this time, at the same coords as the dynamite room. I go downstairs and spawn at the dynamite room immediately. This time, I hop off the ledge off-screen rather than fight the furnaces. In case anyone wonders why I couldn't simply spawn directly to the furnace boss, the reason was because it seemed to be a separate room; from my tries, attempting to "break in" to the boss chamber lead me stuck OoB. 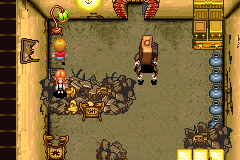 This time, I don't backtrack to Basement 1, and immediately head to the boss. Once again, I thank "Luigi the Best" for finding out that auto-firing "B" allows you to walk through certain objects; that made the boss a LOT faster. I found out Chowder is 37 frames faster than using DJ for this section. It seems every bubble has the same strength (8 iirc) just that charging shoots more at once. I recall this being twice as powerful than DJ's. This time, I do the camera glitch earlier to avoid the bees. I enter the second floor instead so I could rush to the light. Also, dealing the final blow using Chowder is faster by ~10 frames than DJ all the way. Every single address that's relevant to a 100% or any% TAS/run is in EWRAM (Replace "0x3DE7" with 02003DE7 for VBA). The above is relevant if anyone wants to tamper with the save file. Hold A+B once you enter a new floor then without letting go drown or fall off a cliff/hole that doesn't send you to another floor. If you get stuck in a wall, you'll zip at the opposite direction you hold (zip left holding right, etc). The OoB areas appear glitchy at the edges of the map. Pausing and unpausing near there changes the camera focus on you, and potentially spawns objects (or change the ones that already exist). Also reentering the game area can sometimes mess with NPC hitboxes, causing them to move OoB towards you. I'm actually not sure how the objects are determined, just that if I don't pause, the stairs never seems to appear. The stairs/holes outside the game area don't always appear to work right; often it makes you enter a new mostly empty floor but at the same coords. I could've technically skipped the credits by pressing "A", but since I can't skip the dialogue before the credits, I decide not to. The lua script I used is in this post. The address for the coords are only approximates; they fail at far out of bounds edges of the map and in certain rooms like the arcade machine room. jlun2: Found that I messed up a large part of the input. Sorry! Mothrayas: Replaced submission file with a 772-frame improvement.